[Press release] The Ministry for Equity, Social Justice, Empowerment, Youth Development, Sports, Culture and Local Government in collaboration with the Saint Lucia National Table Tennis Association saw the need to develop and showcase the special needs athletes abilities in a fun and safe environment as we recognize the need to ensure that sports are for all. In this case table tennis was the sport used to express their abilities. The Beausejour Indoor Facility was the venue used on Friday 15, June from 10am to 2pm. The Table Tennis tournament took the format of open singles for both the male and female competitors. The Tournament took the format of single elimination one single game to eleven points were played until we got to the semi-finals. Semi-finals through to finals were played two best in three games. Medals were presented to top finishers in the championships. 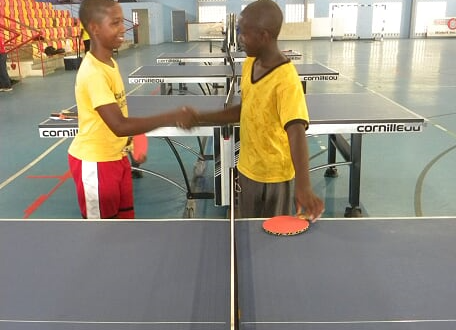 Dante Altinor from the Vieux Fort Special Education Centre and Shanice Stewart from the Dunnottar School dominated the boys and girls open singles event in the third ever Special Ed Table Tennis Championships. The girls event saw 14 girls competing in the knock out stages. The first semi-final match saw last years champion Shanice Stewart from Dunnottar winning over Rochelle Alcindor of the Soufriere Special Ed 11-4, 11-4 . The second semi-final match saw Solange Le Blanc from Edu Care defeating Shivelle Norbal from the Soufriere Special Ed 11-5, 11-3 . The finals witnessed the confident and passionate Shanice Stewart winning in straight sets over Solange Le Blanc 11-1, 11-2 to retain the girls singles championship. The boys event saw 28 boys competing in the knock out stages in three rounds of competiton inorder to get to the semi-finals. The semi-final matches featured three competitors from the Vieux Fort Special Education Centre and one from the Dunnottar School. The matches were quite competitive as the players displayed good tactics and fighting spirit. The first semi-final match saw last years champion Gregor Marcellin from the Vieux fort Special Education Centre conquering Chaddy Herman from the Dunnottar School 11-4, 11-7. The second semi-final match saw last years runner-up Dante Altinor winning 11-8,8-11 and 11-8 over his school mate Jeaneil Moffat. The finals which saw both athletes getting support all throughout the match was quite competitive. Gregor Marcellin put early pressure on Dante Altenor to win the first game 11-7. Dante then responded to win the second game at 11-6. The final set saw Dante getting off to a great start which was good enough to give him the victory at 11-6 over Gregor. Over one hundred students from the six schools had the opportunity to participate in six Physical Literacy activities which involved developing their ABC’s for the sport of Table Tennis during the championship. Agility Ladder & Forehand/Backhand roll to score. The students who completed all six activities were presented with certificates. The 3 best performers in each stage for both the boys and girls categories were also rewarded with medals. The best boy and girl were also recognised as most physically literate athletes. The 100 plus students took part in the 6 stages of physical literacy activities with a focus on the ABC’s (agility, balance, coordination and speed). These activities went on throughout the day as many students displayed their skills. Hazel Neptune from the Soufriere Special Education Rehabilitation Centre and Shanice Stewart from the Dunnottar School were both named most physically literate male and female Special Ed athlete.